The extreme and mysterious landscape at the southernmost tip of Africa has been the inspiration for the Ghost Corner wines. More than 130 ships have found their last resting place in these treacherous waters where compass readings show no deviation between magnetic and true north and navigation was just about impossible on dark and stormy nights. 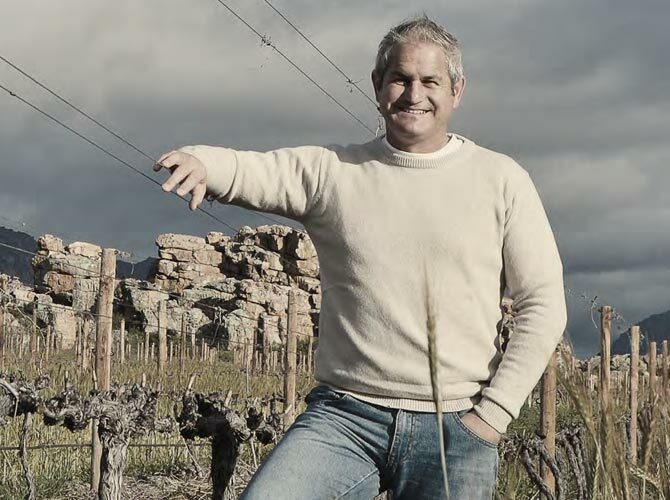 Inland from this dramatic coastline, in the Elim Ward, lie the vineyards where David Nieuwoudt is making the most of excellent growing conditions, cooling southeasterly breezes and extreme climate. The deep lime-rich soil with plentiful slate and gravel deposits are perfect for growing Semillon, Sauvignon Blanc, and Pinot Noir grapes. Ghost Corner is a range of wines that linger on the palate, evoking a sense of mysteries past. These are unique wines from an extreme terrior at the southernmost tip of Africa. Naturally fermented sauvignon blanc. Enticing aromas of fleshy white pear and quince with an illusion of sweetness. Nine months barrel maturation gives a creamy, full-palate with beautiful length. Well paired with fresh seafood or a creamy pasta. Best enjoyed right away, but potential to age up to five years. An aromatic Semillon displaying aromas of green fig, white fruit and nettles characteristic of the cool climate in Elim. A distinct minerality with a slight earthiness on the nose that follows through onto the palate. A small amount of French oak adds a hint of smokiness leading to a creamy palate with a crisp acidity. This wine is especially well suited for strong seafood flavours such as yellowtail, scallops or snoek, as well as lightly smoked meat and rich pork dishes. Sailors call the bowline the ‘king of knots’- a strong simple knot that symbolises union, completion and eternal devotion. This white blend ‘ties the knot’ between Sauvignon blanc and Semillon. Ripe asparagus notes from the Sauvignon blanc complement the green fig and dusty elements from the Semillon. A complex wine with well-balanced oak with a refreshing, smooth finish. Enjoyed with roast chicken or fresh seafood.